If you ask the Freezer Meal Frenzy staff to choose between sweet and savory pies, we’ll pick the savory pies every time. We love the combination of flavorful ingredients and a nice flaky crust. 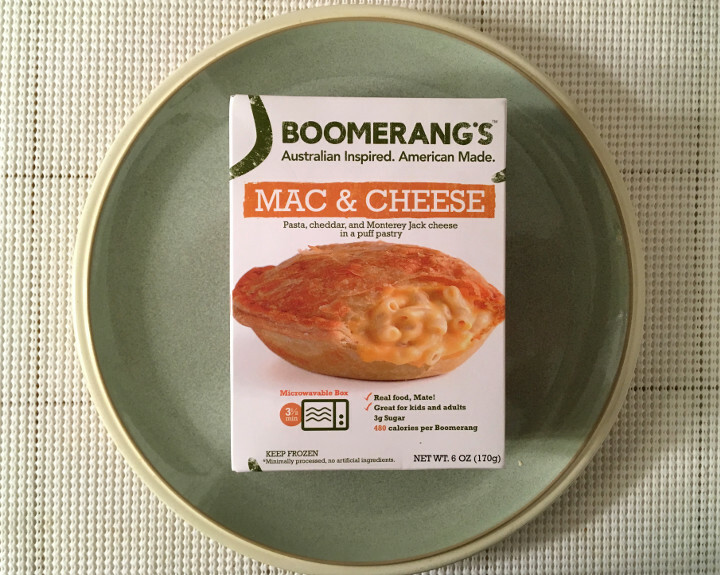 Since we also love mac & cheese, picking up the Boomerang’s Mac & Cheese Pie was a no-brainer. 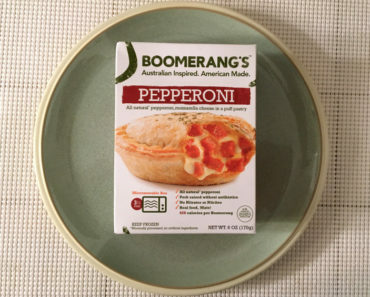 Like other Boomerang Pies, this pie is designed to be cooked right in the box. 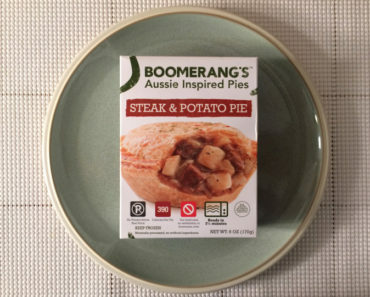 Once you’ve heated it up in the microwave, you can slide it out of the box and onto a plate. After that, you just have to wait for it to cool off so that you can dig in. A light, flaky crust is key to a good pie, and this pie doesn’t disappoint. This crust crumbles at the mere touch of a fork. It also has a nice buttery flavor to it, but the taste isn’t overwhelming. The macaroni and cheese is the centerpiece of this meal, and the crust is just there to compliment it. Even though it’s surrounded by pie crust, this mac & cheese is incredibly creamy. There’s a slight richness to the flavor of the Monterey jack cheese sauce, but we wouldn’t say it tastes decadent. It feels more like a comfort food than anything else. Since the pie crust is so flaky, you wind up with lots of little pieces of crust in the sauce. It delivers the same effect you get when you put bread crumbs on macaroni and cheese; it’s an effect we really enjoy. 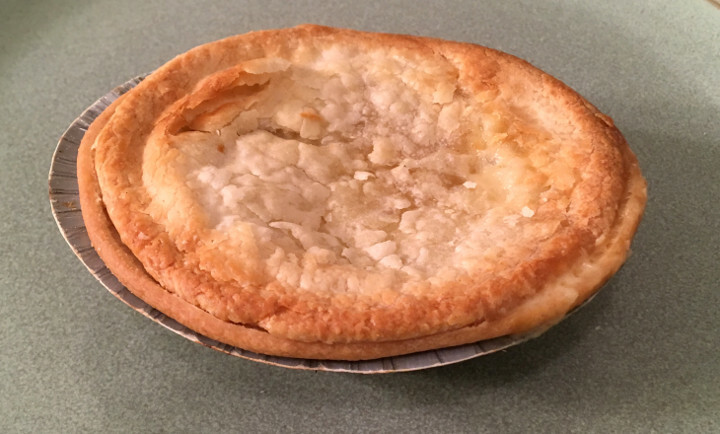 As you might expect, this little pie isn’t a diet-friendly meal. There are 480 calories per pie, and nearly half of those calories come from fat. That said, we found the pie to be satiating in spite of its small size. 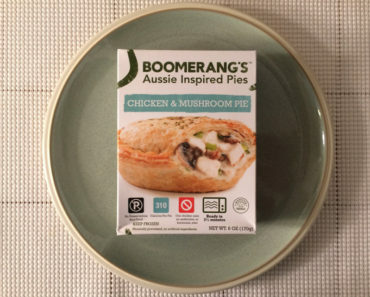 If you do wind up treating yourself to one of these pies, you can expect it to fill you up. The Boomerang’s Mac & Cheese Pie was everything we wanted it to be. It’s the perfect combination of a puff pastry and a creamy, cheesy pasta. 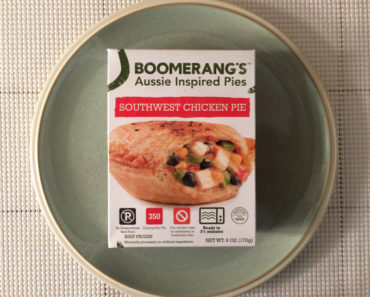 If you enjoy savory pies, and you also love mac & cheese, you should definitely search for this dish in your freezer aisle. 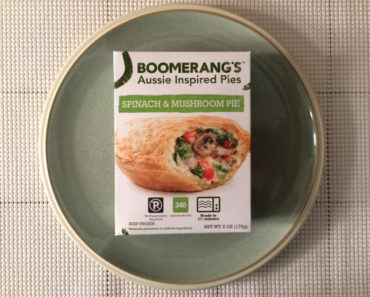 To learn more about the nutrition content or ingredients in this Boomerang’s pot pie, check out our package scan below.